What would you sacrifice for freedom? This February, characters in BOOM! Studios’ new series Cluster are asked just that—and don’t have much of a choice. 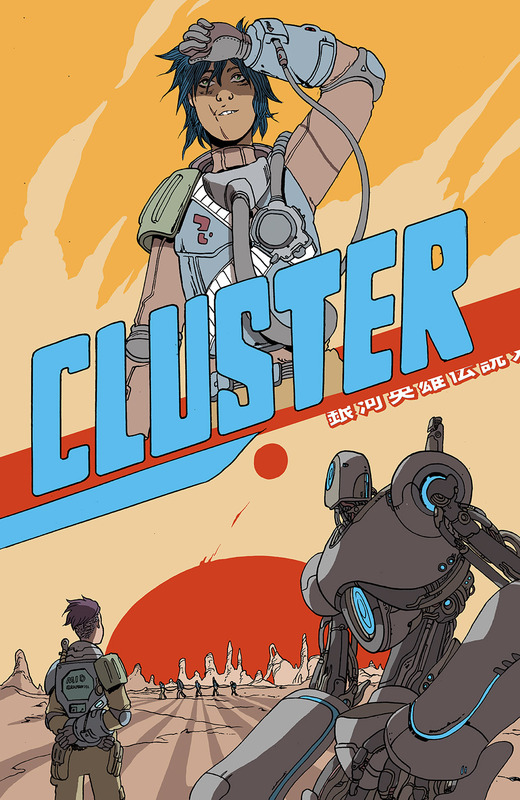 And Cluster boasts some fantastic talent in Ed Brisson and Damiam Couceiro to tell a story set in a distant future where humans have discovered life on other planets. Faced with a shortage of manpower, and in order to protect their colonies across the galaxy from other species, Earth’s government has resorted to offering prisoners a chance to shorten their long sentences in exchange for serving as an interstellar soldier. More and more soldiers are needed as wars continue, so small crimes are met with long-term punishments. But when a group of prisoners-turned-soldiers are marooned on enemy soil, they’ll need to work together to survive and uncover the truth behind Earth’s role in deep space. 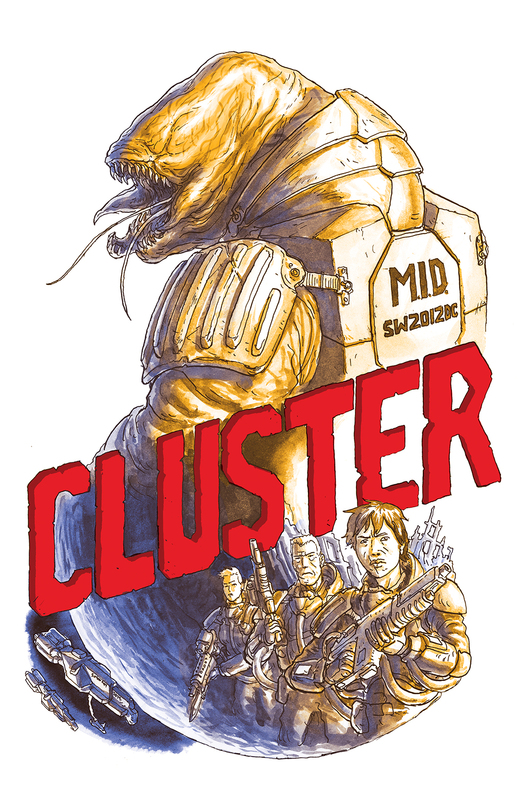 Cluster #1 arrives in comic shops on February 4th with a main cover by James Stokoe and a 1-in-99 “Jackpot” variant cover by Simon Roy for the price of $3.99 under Diamond order code DEC141166. Also available are a 10 Years Anniversary incentive cover by Trevor Hairsine and a retailer incentive cover by Declan Shalvey. In addition, as part of BOOM!’s ongoing 10 Years celebration in 2015, if orders for Cluster #1 surpass 10,000 copies when retailers’ Final Order Cutoff (FOC) closes, a special 10K variant cover by Brandon Graham will be unlocked and shipped with the main covers in a 90/10 split. The FOC deadline for retailers is Monday, January 12th. January 5, 2015 (Los Angeles, Calif.) - What would you sacrifice for freedom? This February, characters in BOOM! Studios’ new series Cluster are asked just that—and don’t have much of a choice. 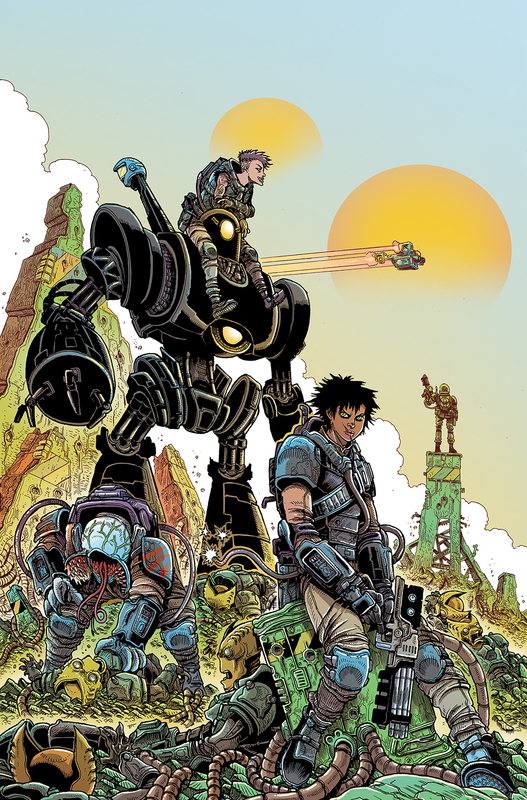 Created by the team behind the latest run on BOOM!’s Sons of Anarchy comic series, writer Ed Brisson (The Field, Sheltered) and artist Damian Couceiro (Planet of the Apes) tell a story set in a distant future where humans have discovered life on other planets. Faced with a shortage of manpower, and in order to protect their colonies across the galaxy from other species, Earth’s government has resorted to offering prisoners a chance to shorten their long sentences in exchange for serving as an interstellar soldier. More and more soldiers are needed as wars continue, so small crimes are met with long-term punishments. 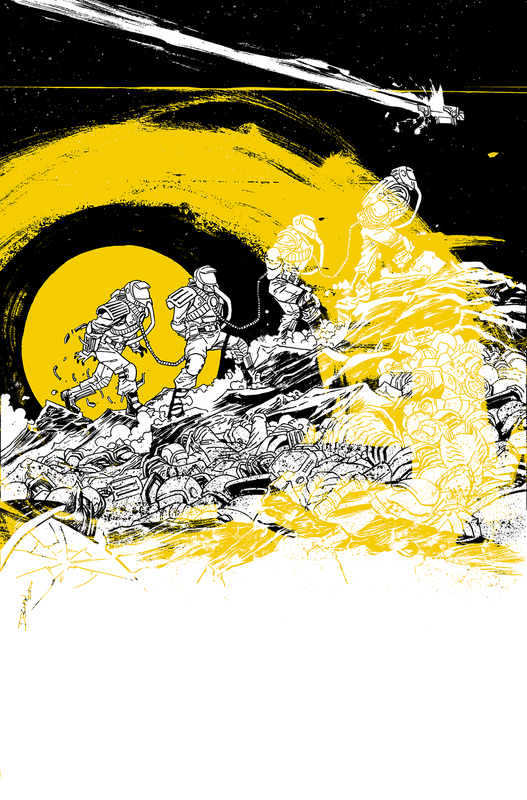 But when a group of prisoners-turned-soldiers are marooned on enemy soil, they’ll need to work together to survive and uncover the truth behind Earth’s role in deep space. In addition, as part of BOOM!’s ongoing 10 Years celebration in 2015, if orders for Cluster #1 surpass 10,000 copies when retailers’ Final Order Cutoff (FOC) closes, a special 10K variant cover by Brandon Graham (Prophet) will be unlocked and shipped with the main covers in a 90/10 split. The FOC deadline for retailers is Monday, January 12th. Not sure where to find your nearest comic retailer? Use comicshoplocator.com or findacomicshop.com to find one! It’s also available for order directly from boom-studios.com.